In addition to a pair of new Nexus smartphones, Google unveiled two new Chromecast devices during its announcement-filled media event earlier today in San Francisco. The new Chromecast connects to your television set much like the original via HDMI. Google has redesigned the dongle, opting to go with a circular design that features an integrated HDMI cable in an effort to improve usability where real estate may be limited and to help reduce interference. The device more or less functions just like the original, allowing users to cast content from a mobile device or notebook to the big screen. There are, however, some notable upgrades like support for 802.11ac and 5GHz Wi-Fi and three total antennas inside the device (up from just one in the original). Google also made sure to let those in attendance know that there are now thousands of apps that support Chromecast, a vastly different scenario versus when the original broke cover two years ago. Some examples include Netflix, Google Photos, Discovery and DirecTV NFL Sunday Ticket. Sling TV is adding support in the coming weeks, we’re told. The second new device is called Chromecast Audio. It’s a small device – also shaped like a hockey puck – that plugs into a 3.5mm AUX jack (or RCA or optical-in via cables that aren’t included) on your existing stereo system. With it, you’ll be able to stream tunes from your mobile device to your big boy speakers – like video casting, but for music. 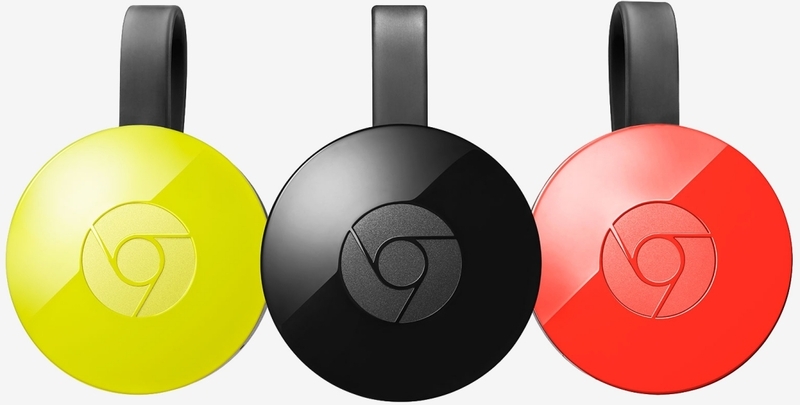 Both new Chromecast devices are available for purchase as of writing at the familiar $35 price point.